Not every feral hive is varroa resistant. Some feral hives were probably established by swarms from European hives or were European hives that absconded because they were overwhelmed by varroa. I've hived swarms and "young" cutouts (meaning a hive that was just recently established) that didn't survive, and I suspect it was varroa. One day, you go to the bee hives and the bees are gone. Another possible scenario is that a feral Africanized hive superseded the queen and the new queen mates with European drones. The workers from that mating may not have the varroa hygiene behavior. The post is hollow, has a light on the top and electricity was run into the post for the light. The electrician made a hole in the back of the post to run the wire, about where the arrow points. It's not a big entrance and is covered by shrubbery but the bees seem to get in and out just fine. 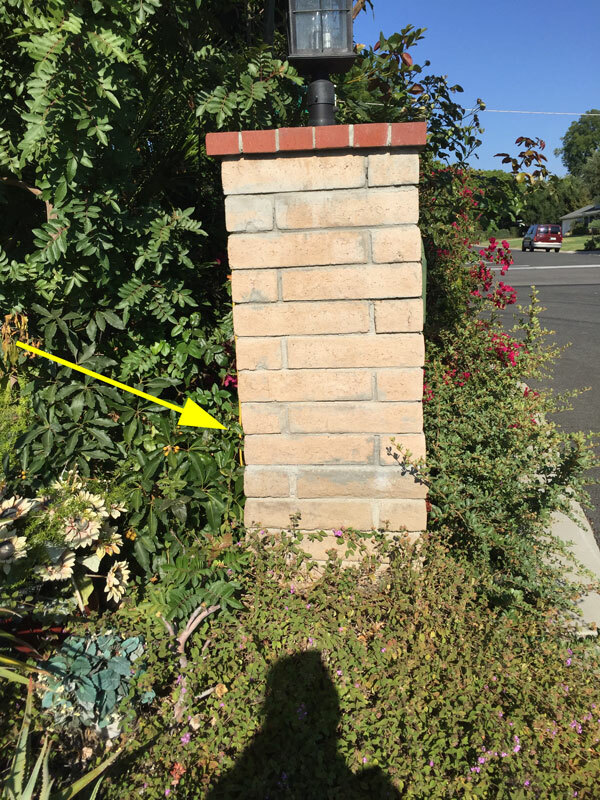 It would be impossible to do a cutout on this post so the bees have a good safe place to live (unless the homeowner sprays then with insect spray). I can go very close to the entrance, moving aside the shrubbery, and the bees ignore me. They are obviously able to deal with varroa and are not so defensive that they attack people walking by. I discovered them several years ago and they were probably there several years before that. [Update 10/2/2017] I was told by a bee expert at Pomona college that they estimate (from genetic testing) that about 70 percent of the feral hives in Southern California are Africanized and 30 percent are European.